There is nothing better then having a great bride and groom and bridal party and that they are comfortable with me as a wedding photographer. When I am so blessed to have the perfect venue like The Westin Resort & Spa in HHI, then I know I will have a great wedding to document. I usually will start with pre ceremony photos, witch includes photographing first the groom and the groomsmen then the bride and the bridesmaids, generally. Then comes the ceremony and the family photos, and then the bride and groom and the bridal party. I knew that when it came time for me to photograph the after ceremony photos with the bridal party and the bride and groom, finding the right location was key. This resort, The Westin Resort & Spa in HHI as so much to offer this place is huge, in front you have an amazing fountain, the hotel is grand and spacious with rich color, mirrors and chandeliers, to the pool area, and then my favorite the beach. While I photographed many different types of images with the bridal party, as we walked around the property, they commented all day on how impressed they were that I took my craft so seriously, by carrying so much equipment, 3 pro cameras, and various lenses, batt packs, strobes, and extra batteries, they commented on how I keep myself fit, how I wanted to walk around with them to many different location to achieve many different photos for all of them. Then came the last photo of all of them together. 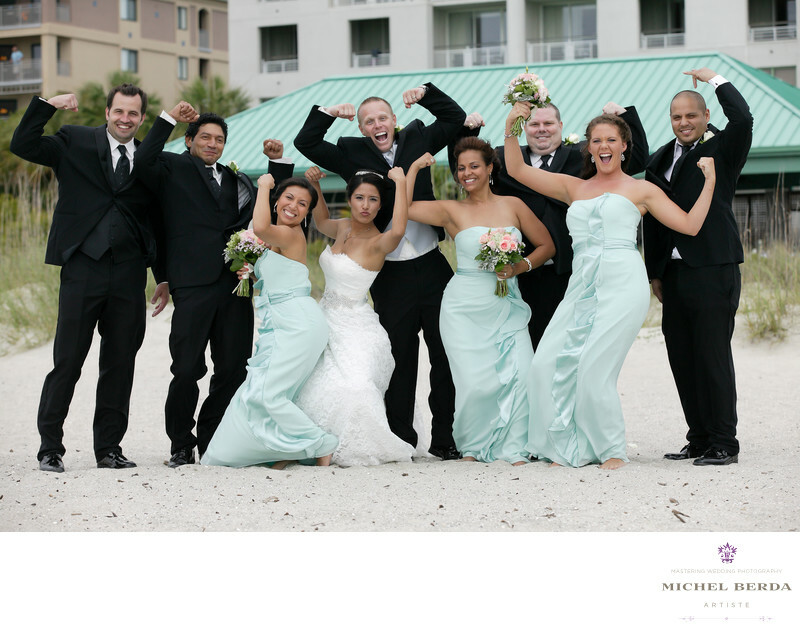 There are times when you want the bride and groom and the bridal party to be themselves and strike their own pose and so when I asked them to, they came out with this perfect pose. Nothing better then everyone having a great time, more importantly the bride and the groom having their perfect day, always my goal.Keywords: Destination Wedding Photographer (117), Hilton Head (75), sc (309), south carolina (24), The Westin Resort & Spa HHI (27), The Westin Resort & Spa in HHI Weddings (27), Wedding photographer In Hilton Head (66), Wedding Photographers (198), Weddings (168).